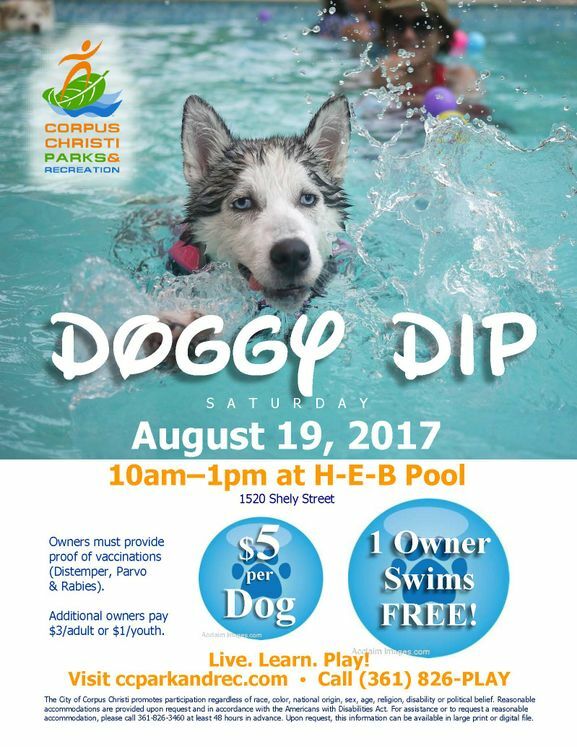 CORPUS CHRISTI, TX – For a splashing good time with your furry friends, the Corpus Christi Parks & Recreation Department invites all dogs and their owners to its Annual Doggy Dip on Saturday, August 19, 2017, from 10am­­–1pm, at the H-E-B Pool, 1520 Shely Street.This will be the last big splash of the summer before the pool closes for the season. Bring your dog to the pool for this fun end-of-summer event! It’s a safe no-leash environment where your pet can frolic in the water and play with other dogs. Each year, tail-waggers and their owners are thrilled to join our popular events. It’s a great way to cool off from the summer heat. Dogs swim at their own risk and that of their owner’s. Any dog owner wishing to participate must provide proof of Distemper, Parvo, and Rabies shots before their dog will be permitted into the pool facility. The leash law will not be in effect; however, unruly pups and pooches will be asked to leave. All owners are expected to clean up after their dog. Females in heat will not be allowed. Pool admission is $5 per dog and one owner (additional owners pay $3 per adult, $1 per youth). For more information, call (361) 826-PLAY.